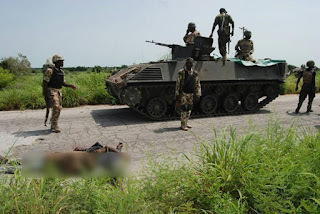 The Nigerian government on Tuesday ordered the military to go after those behind banditry in Zamfara and other states. A statement by Colonel Tukur Gusau, Public Relations Officer to the Minister of Defence, said the government was concerned about the security challenges in the North-West, particularly in Zamfara, Sokoto, Katsina states and Birnin Gwari axis of Kaduna state. It said due to the recent prevailing security situation in the states, the Ministry through the Nigerian Army is now conducting Exercise HARBIN KUNAMA IV simultaneously in Zamfara, Katsina and Sokoto States. “The purpose of the exercise is to effectively flush out the activities of criminal elements in the North West”, it noted. “The Nigerian Air Force has also intensified air strikes against the bandits in Zamfara. So far, the combined efforts have yielded to lot of successes leading to the killing of many bandits, rescue of many innocent persons including the renowned Islamic scholar Sheik Ahmad Suleiman. The statement added that as part of ways to provide security, the Nigerian Army has established 8 Division with headquarters in Sokoto to cover Kebbi, Sokoto, Katsina and Zamfara states while the Headquarters of 1 Brigade was relocated from Sokoto to Gusau. “Presently the tactical headquarters of 8 Division has since located to Gusau. Similarly, the Nigerian Air Force also established Quick Response Force in Gusau and landing areas in Gusau and Birnin Magaji respectively,” Gusau said.